Over the course of two decades of studying paediatric infectious disease, I have seen many sick children rendered weak and dehydrated, their families bearing the emotional and financial burdens of seeing an ill child suffer. However, what really breaks my heart is seeing the sheer number of children lying sick in hospital beds because of a disease we have the tools to prevent: rotavirus diarrhea. Rotavirus is one of the most common causes of severe childhood diarrhea. In Vietnam, nearly half of children hospitalized for diarrhea suffer from rotavirus; two to three children lose their lives to the disease every day. Interventions such as exclusive breastfeeding, handwashing, and improved sanitation are critical to prevent many causes of diarrhea, but rotavirus diarrhea is common even in developed countries with high levels of hygiene and sanitation. Vaccination against rotavirus is an essential component of a comprehensive approach to diarrhea prevention and control. Vaccines are one of the most effective and cost-effective health interventions available today. They protect children from serious infections that can sometimes lead to disability or even death. Vaccines improve health, reduce health care costs and save lives today in countries where they are routinely used. Additionally, vaccines provide indirect benefits to others in the community who aren’t vaccinated—including the elderly, children too young to be vaccinated, and those with weak immune systems—through a phenomenon called herd protection. 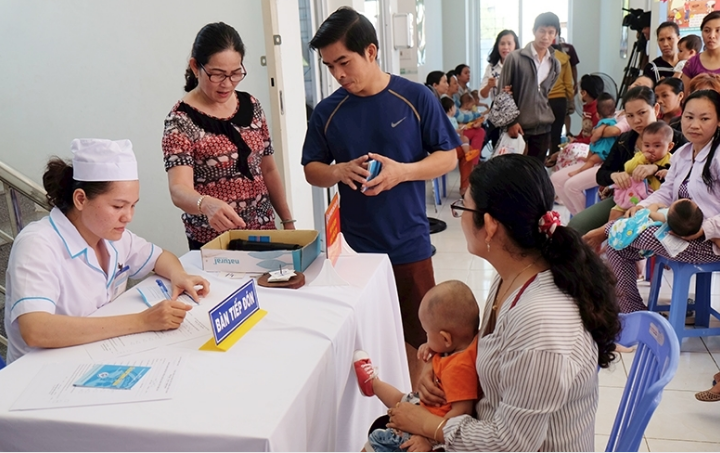 Immunization also has the potential to help reduce the high rate of child hospitalizations in Vietnam, where occupancy rates reaching 120-160% have resulted in bed shortages in many central and provincial hospitals. A study from Bangladesh found that routine use of rotavirus vaccine could release over 600 beds every year in the country, allowing hospitals to admit more patients suffering from other life-threatening diseases. Vietnam has made tremendous progress in improving and protecting our children’s health. Child stunting and infant deaths have been significantly reduced in the last two decades. With 96% of children vaccinated against diphtheria, tetanus, and pertussis (DTP), our immunization coverage rates match or surpass those of some western nations. We are among the frontrunners using technology to improve access to vaccines and reduce stock-outs. Health care workers are given phones and tablets to access and update immunization records and send vaccination reminders to parents. As part of the government’s commitment to save lives and prevent avoidable disease and suffering, the National Expanded Program on Immunization (NEPI) offers 12 vaccines free of cost to all children. These vaccines have protected more than six million children and prevented more than 40,000 deaths in the last two and a half decades. Prime Minister Nguyễn Xuân Phúc recently approved the budget for immunization through to 2020, guaranteeing increased domestic financing for both vaccines and the cold chain required to ensure they reach the communities where they are used. Additionally, we are actively working to develop indigenous vaccines; more than 10 vaccines have been developed here in Vietnam to help protect children from dangerous and deadly diseases. Although more than 90 countries have introduced rotavirus vaccine into their routine immunization programs, fewer than one in two children have access to the vaccine worldwide. Most children in Vietnam do not receive this important vaccine to protect them from this leading cause of severe diarrhea, as rotavirus vaccine has not yet been introduced into the NEPI. In fact, few South and South-East Asian countries have introduced rotavirus vaccines. Vietnam has the opportunity to lead the way by introducing rotavirus vaccines into our routine immunization program, protecting our children and setting an example for other countries to follow. I am proud to live in a country that has led the way in establishing a strong preventive health system with near-peerless rates of high immunization coverage. And I feel hopeful for a future in which no children are hospitalized for rotavirus-induced diarrhea. The introduction of rotavirus vaccine and the continued support of other new vaccines for the Vietnamese people is critical in making this vision a reality. Quảng Bình: The article was published on the home page of the online media outlet. Báo mới: This is a popular media outlet in Vietnam that aggregates news and stories. Đại đoàn kết: This outlet published a condensed version of the story highlighting the disease burden of rotavirus-induced diarrhea, its symptoms and need for introduction of RVV as an effective prevention tool.